Namkeen Ghost is famous, simple and delicious recipe belongs to the cuisine of KPK, it is made commonly at Quetta, Baluchistan and Peshawar. But in Punjab people opt for it either during Eid-ul-Azha or for special family functions. 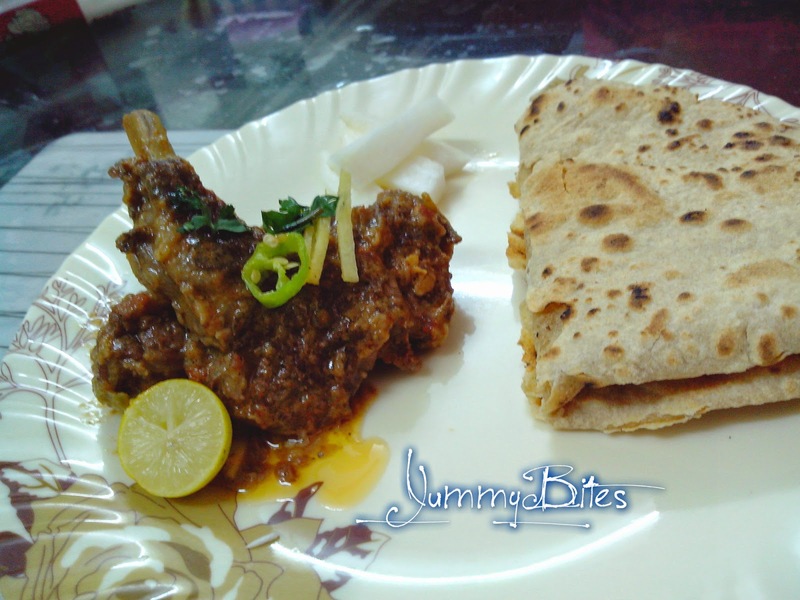 During my research for authentic Namkeen Gosht recipe, I came across a lot of conflicting concepts and preparation methods and it became difficult to ascertain which one was really authentic. While some recipes suggested use of papaya as a tenderizer while others suggested use of vinegar. Some recipes advocated use of just garlic, others suggested use of both ginger and garlic. Some preparations indicated use of black pepper and others said “stay away”. Then there were a few that prefer the use of tomatoes, turmeric, red chilies as well. This was enough for me to enter a state of total analysis paralysis. After a lot of research about KPK cuisine I came to know that the recipes flowing on Internet and news papers are combination of both KPK and Punjabi Cuisine. As people in KPK cook meat with animals own lard hence use very less amount of cooking oil. They neither use variety of spices nor in excessive amounts, according to their cuisine's basic and psychology "the less spices the more flavor". Where as, in Punjab food is vice versa and famous for its variety of spices and shimmering oil layers on top of food specially gravies and curries. There fore recipes using vinegar, all are combination of both cuisines. Traditionally, in KPK cuisine this decadent dish was made with either beef or goat’s meat, both having higher fat content, simply cooked with salt, black pepper, carom seeds, lemon juice, vinegar and little bit of oil. However in Punjab the people are more spice lover they made their own version by adding curd, onion, tomatoes, chillies, coriander, cumin, garam masala to get more flavorful Namkeen Goshat. So! I decided to use a simple set of easily available ingredients and the method my mother use to cook Namkeen Gosht in Punjabi style. The meat I had used for recipe was goat meat but the extra lard or fat has been removed. In this case if the meat doesn’t have much fat, do consider using a bit of “Ghee“. The process however is extremely simple. You essentially let pieces of meat with fat simmer gently within it till the meat is fried somewhat and may be a cup of stock or simple broth (Yukhni) left by which the meat is delightfully tender and juicy. The results were spectacular. Hope you all like my Punjabi Namkeen Gosht Recipe that follows below. Take the meat with little fat and bone on it. Take medium size cooking pot I am using pressure cooker, put on the flame, pour in oil and ghee together, as it warms up, put meat and salt in it and fry till it is slightly golden. Add sliced onion, cook and mix well till onion become translucent. Now add the yogurt and cook for an other 5 mins in pressure, open the lid add remaining spices and stir it for some minutes.Garnish it with lemon quarters, thinly sliced green chillies, coriander and ginger and Serve it with naan or chapati. I really don't frequently consider using almond-milk in savory recipes...they all look yummy even however!